I don’t know exactly why at some points in my life I will become emotionally numb. Laying here in my bed this morning- I feel so numb and blocked. It is totally strange to me that sometimes when I think about situations I have been in or triggers- nothing happens. It’s like my brain doesn’t even process it. But then other days,if I think of something that triggers me, even just for a few minutes, I get so depressed, anxious or scared. http://ptsdusa.org/what-is-ptsd/get-help/ is a website I just found. You might be able to copy and paste it into your browser if you can’t click on it here. This website breaks down PTSD into 3 categories of reactions. 1. 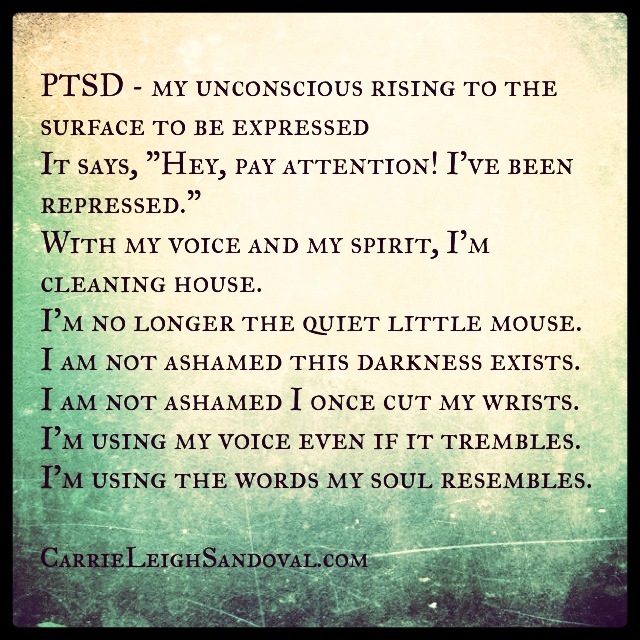 Re-Experiencing Symptoms- Vivid flashbacks, panic attacks, thoughts, images with intense emotions and more. 2. Avoidance Symptoms- Avoiding certain people, situations, numbing yourself by drugs, food, feeling “dead inside”, distant from others including family and more. 3. Arousal Symptoms- Insomnia, jumpy, self harm, abandon God, fear of further trauma, poor memory and more. I honestly feel like I am in a cycle of between these 3 stages. I hope this helps someone out there understand or bring clarity to your own situation. I can’t type much more about this without getting too upset for the rest of the day. Til next time. Every traumatic event that has happened in my life except a few I can either tie my m. into or directly from her. So you can just imagine the sort of triggers I have. They always bring me into this loop of love, hate, sadness, brokenness, confrontation, anger, hopeless, longing- the list goes on. I have never had the luxury of telling her off and bringing her to her knees. I would like to do so, especially when I was a teenager. I wanted her to be reminded of everything she had done to me and be so incredibly sorry she had no choice but to be heartbroken. On the other hand I want to yell and scream at her everything she has made me feel and confront her on everything. I actually tried that once but more peacefully and honest. She ignored everything I said and just said I need mental help and how “attacking” I was and that I didn’t see her doing this to me. Then of course my s.d. piped up and told me how wonderful my m. had been to me and provided for me all these years. Most of the time though- I just wish I could forget her. I wish she wasn’t my m. I wish the person treating me like this was just a friend I could easily cut out of my life and forget. Honestly there are times I wonder what it will be like when she dies. Will I be sad or will I feel like I can finally be myself without having to worry about her? Kind of like the saying “when the boss is away…” When she is gone I can have free contact with my sisters? I love them dearly but they are still under her control and household. They were born several years after me. They have been home schooled all their life and have no idea about what goes on between m. and I. And I think if they did they would see if more from my m.’s perspective than mine because “she is an amazing mother”. And to them she might be, but for some reason I am a trigger to my own m. which she wishes to cut out. So far she has done a fantastic job at. Emails now only on birthday and holidays that are generic greeting cards. No calls, no invites to recitals, birthdays, dinners, lunches, events, holidays- nothing. I am so sick and tired of being treated this way. I stay around trying to please her and be the daughter she wanted just so I can see my sisters and try and build a relationship with them. Now it doesn’t matter. This is the first year it doesn’t matter I am uninvited no matter what. Speaking of being sick and tired and I am also fuming mad. I want to break down the door and fight for what I want. But when someone is mentally ill like my m. you can’t fight fire with fire. You have to be the bigger person. When I “be the bigger person” it feels like I am letting her win and I am just rolling over and taking it. My stubbornness doesn’t like that thought at all. I have no idea as to why I am trigger to my own m. Maybe because I look like my dad, I am very close to my dad and she messed it up with him. Maybe it’s because she links me to herself and instead of seeing as an individual- she sees herself. That would explain some of the treatment. Also she has screwed up with me several times, including letting my sexual abuse happen right under her nose. Having our dog attack me, which I talked about in the blog The Trees’ Secret, and seeing the scars on my face. I don’t know what else it could be but it makes me feel ugly and like dirt. Have you ever had such an intensity of wanting to love and forgive to then despising and hating? It really pulls at you and confuses your heart. Do you love or hate the person? Do you want to be in their life or not? The hardest triggers I have to say is my sisters’ birthdays. They are so innocent, sweet and loving. I just want to be there to celebrate their life with them. But I am not allowed. Instead I get emails (if I am lucky) that tell about how much fun they had celebrating it and how perfect their life is. Talk about rubbing my nose in it. It hurts so bad I can’t feel it. If that makes sense. That has happened so many times over the years- it is just something else that I stuff down deep inside of me. If I try and let myself experience those emotions I either get so worked up I am on edge for a few days/weeks after or I am feel so unwanted I want to cut myself over and over OR I will sink into a very deep dark depression. I have no idea how to deal with these emotions or how to express them in a positive way. So I stuff. I do have a wonderful step mom that has been in my life since I can remember. I call her momma in the privacy of our own home. I can’t do it publicly or I will hashed out from my real m. And I would rather avoid that situation. Because my real m. loves to turn into the victim and make me out to be the bad guy every time. “See how ungrateful she is? And after all I have done for you…” “See, she is rebellious” etc. Even at get togethers if I go- she doesn’t sit next to me or even talk to me really. It is awkward. It gets worse- she will act like we are the best of friends for everyone to see and how much she loves me. When in reality that is the first time I have seen her all year. My m. never ever calls me on the phone. When she has it is so awkward and seems so fake. From the way she says hello, to the time limit she puts on it, to the way she says “I love you”- it makes my skin crawl. So for her to call me, means someone has died, literally. One time she called me after a very hard passing of someone on my dad’s side. As you guessed it- it took me for a loop when I saw who it was. She basically wanted information of how it went and how I was. When I say information- I mean just that. She looks at like “she would be in the know”. Well I am sorry, but if you aren’t there for me at all in life why do you think I would open up to you just so you can find out how it all happened. I told her I was fine. There was a long pause as if she expected more. Politely I thanked her for calling and ended the call. She was MAD at me. And I can tell you because she will do things in spite of me when she is. It gets very old that I can predict down to the words of what she will say or do. It is embarrassing for her not to know what is going on in my life when others ask about me. Which is probably what prompted the call in the first place. She takes great pride in having the “best mom award” and if I don’t see how awesome she is then that is my fault. I think another reason why she cuts me out and my therapist agrees with this- I can call out her BS. Excuse the language but it’s true. I can see through her and that makes me take pity on her but at the same time I don’t roll over either. I maybe silent but that is because she knows not to provoke me. I pity her because she has some bad things happen to her when she was younger too. I have no idea about any of it but I do have hints about it. And I can see how when a traumatized girl turn into a mother herself, she can’t emotionally be available to her daughter because she doesn’t know how to be. It is too painful. That is why I want help. I do not want to be like that. I want to break the cycle and be the best mommy in the whole wide world. I will love my child unconditionally, I will nurture that child into whatever he/she would like to be in life. And the best part is- I don’t want recognition for it. I don’t need to stand on a pedestal and get the attention for my ego. I just want that person to know how much I love him or her and how much I believe in them. 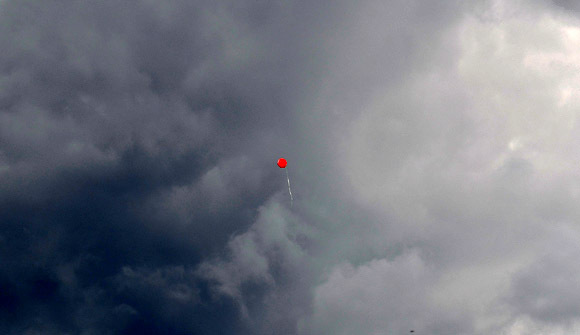 I titled this blog The Lone Balloon because that is what I feel like. I want to be involved in my sisters’ lives and esp. around birthday/holiday time. I feel like the lone balloon a little kid forgets to hold onto. I am continually floating farther and farther away and no one notices or cares.